1971-72 AMC Javelin / AMX V-8 Lower Radiator Hose 1968-74 AMC V-8 Bypass Hose With Part Numbers Etc. 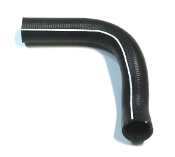 1971-74 AMC V-8 Bypass Hose With Stripe & Part Numbers Etc. 1969 AMC AMX / Javelin 5/8" Heater Hose 1969-74 AMC AMX / Javelin V-8 Fan To Pulley Screws 2 3/4" 1970 AMC AMX / Javelin Radiator Fan To Pulleyt Screws 2 1/2"